I have to be honest. Going into the theater this afternoon, with the same friend I saw Twilight with four years ago this month, left me feeling pretty nostalgic. I’ve read all of the books several times. Have memorized all of the music on the soundtracks. 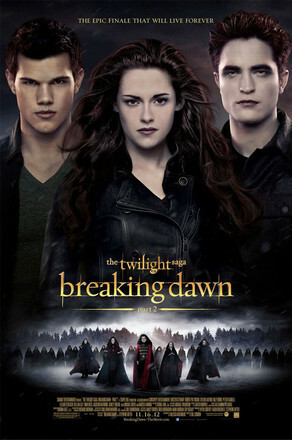 And with this final installment, the series that created the intense, world wide, vampire phenomenon, comes to an end. It’s important to remember that these movies won’t be winning any Academy Awards. Some of the dialogue is awful and often the acting even worse. But that doesn’t mean they aren’t fun. I’ve only seen this one once so far but I feel pretty good about calling it my favorite of the five. Though, it definitely had it’s issues. I understand the need for a CGI baby. You can’t direct infants. But it was weird. And a little creepy. The little girl she grew into, though was darling and I loved the familial interactions. Watching Edward with her filled me with warm and fuzzy feelings and may have caused a bit of a squeal to escape. I loved Bella as a vampire. It certainly cut down on the cringe worthy moments and the incredibly awkward dialogue. Not that it was completely gone. But less of that is always better. She was graceful and strong and her scenes with everyone were greatly improved. And her moments with Edward were fantastic. Swoonworthy even. The fangirl in me was swept away by all of the romance. I was excited when I learned that they were going to change up the end a bit. After reading the books so many times, it was nice to look forward to a surprise. And what a surprise it was. They actually had me convinced that we wouldn’t get the happy ending we were all looking forward to. The loss of so many characters we’ve grown to love was heart breaking and a much bigger shock than I was prepared for. When they finally revealed the truth of it all, I felt sufficiently mind f**ked and it took me a few minutes to recover. Awesome. My favorite part of the movie was the end (HA! not because it was over). Bella’s gift of showing Edward just how much she has always loved him was filled with flashbacks from their most beautiful scenes from the first four movies and I’d be lying if I said it didn’t make me a tad emotional. The way they set it up was really stunning. I’m sad that they skipped Bella’s first jump out the window and her throwing the high heeled shoes back at Alice. It wouldn’t have taken much time and it was a really cute moment from the book. Bella’s arm wrestling match with Emmett was really fun and her fight with Jacob was really intense. Both were awesome to watch. I want Bella & Edward’s house SO bad. I am mad that they didn’t make the bedroom look like the one on Isle Esme (as it was written) but it was an incredible, gorgeous home. Michael Sheen as Aro let out a laugh on the battlefield that was really strange. Scary, almost. Not really sure why that’s the take they decided to go with. It was weird. Could not get enough of the happy, laughing, Edward. We’ve never seen him so full of smiles. It makes me giddy just thinking about it all again. What did you guys think? Did you hate it? Love it? Are you happy with the way that it ended? Are you upset that it’s all over? Are you going to go see it again? You’re welcome to come with me. I can’t wait!